How To Link Aadhaar Card To Telenor Mobile Number: Hi folks, many of us here are Telenor SIM card users and most of us already have the message to link your Aadhar card with your mobile number. 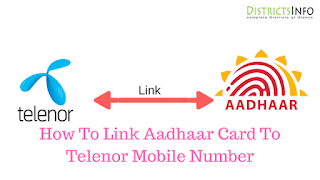 Telenor has already begun sending Message To Link Your Aadhaar Card With Telenor Mobile Number, and most other operators also send messages to their users. It means that Aadhaar is needed now, or your connection is interrupted by your operator According to The Department of Telecommunication (DOT), the connection of Aadhaar will give its users security and can be Lower Down The Fake SIM Card Holders. Also check here: How to link Aadhaar card to Aircel mobile number. First of all, if you have the previous SMS. Then visit your nearest Telenor retail store.